Police in riot gear protect one of the memorials to the victims of the recent Brussels attacks, as right wing demonstrators protest near the Place de la Bourse in Brussels, March, 27, 2016. A man widely reported to be a main suspect in last week's deadly Brussels terrorist attacks has been released because of a lack of evidence. Belgium's federal prosecutor said Monday authorities had no justification to hold the man, identified only as as Faycal C. Before his release, Faycal C. faced preliminary charges of "taking part in a terrorist group, terrorist murder, and attempted terrorist murder." Media reports suggested his name was Faycal Cheffou and that he was believed to be the third individual seen in an airport security camera footage alongside the two men who blew themselves up there. Photo released by Belgian federal police on demand of Federal prosecutor shows screengrab of airport CCTV camera showing suspects of this morning's attacks at Brussels Airport, in Zaventem, March 22, 2016. It is not clear whether investigators believe he could be the man seen in the grainy CCTV photo, taken moments before the blast. Earlier Monday, police released more airport surveillance footage and asked the public for help in identifying the man, who was wearing a hat and a white jacket. All three men in the footage were pushing suitcases, believed to be filled with explosives, through the airport departure hall. Two of the men were killed in the blasts. The third man, whose bomb failed to explode, has been the subject of an intense manhunt. The attacks, which took place around the same time as an attack on the Brussels metro killed 35 people and wounded around 300 others. 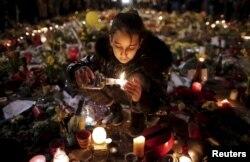 A girl lights candles as people pay tribute to the victims of Tuesday's bomb attacks, at the Place de la Bourse in Brussels, Belgium, March 26, 2016. Authorities have carried out repeated raids in and around the capital, in an attempt to disrupt what appears to be a tight-knit and expansive terrorist network. On Monday, Brussels prosecutors charged three people with involvement in a terrorist group. The men charged were identified as Yassine A., Mohamed B. and Aboubaker O. No other details were released, and the prosecutors did not directly say whether the suspects were involved in the Brussels attack.